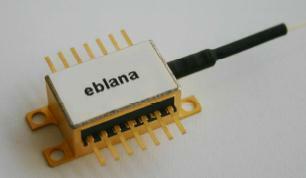 The fiber-coupled 760nm laser diode EP760-DM-B from Eblana Photonics is a unique high power single wavelength laser source. It is supplied in an industry standard 14-pin Butterfly package with a polarisation maintaining fibre pigtail. This 760nm laser diode is ideally suited for the use in TDLAS-based gas sensing systems for oxygen detection.